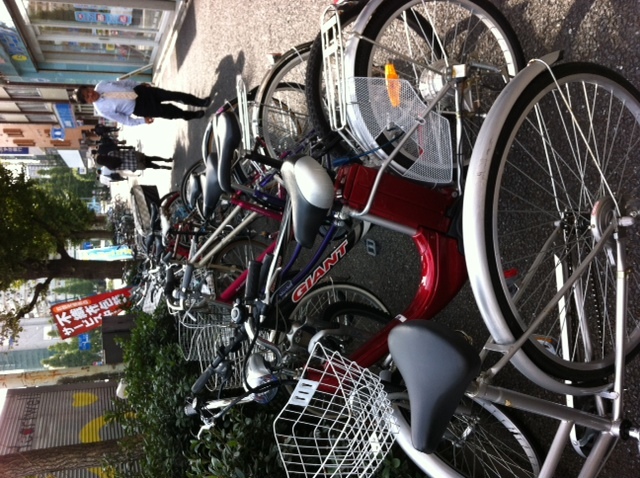 The phenomenon is by no means particular to Tokyo – any city that has a big population of cyclist will have random bike parks – but it feels totally un-American. Americans wouldn’t bunch their bikes together like that and certainly they wouldn’t have 50% or more of them unlocked, like they are here. I’m not sure where else in the world would have a lack of locks like this. To be honest, I have never thought much about bike parking before, but now that I’m a cyclist myself, I think about it all the time. If I take my bike, where will I leave it when I get to my destination? But as time has gone on, I think about it less and less – there is always somewhere to leave my bike. I am one of the few who locks mine, but I can’t help my upbringing. Eyes open, folks. Beware of randomly parked, clusters of bikes! Is it me or do bikes seem to have the right of way on pedestrianised pavements. Either that or it’s a baseless assumption by the rider. Makes walking around fun I guess. Here I am thinking it’s the pedestrians that assume they’re primary and refuse to get out of the way of bikes! I guess it’s all about the moment and about perspective. Thanks for reading. I’ve often wondered what it would be like to live somewhere and not have to worry about locking my bicycle. Having grown up in New York, I find the idea of not locking a bike inconceivable. Even when I leave my bike at work, in the company’s chain-link parking cage, I worry, though not so much as I did when I’d bring in my front wheel when I biked to work in Orlando. In the Washington area, I have yet to park and lock my bike on the street or at a subway station. Aimee, thanks for your blog–you make Tokyo sound as if it is the most civilized place in the world. Maybe I appreciate that more as I get older because it harkens back to a simpler time. Mickey – Tokyo is about 30 years behind the U.S. in so many ways – and some of those ways, like safety and simplicity and kindness are GREAT. Some of the ways, like with gender equality and banking, are not so great. But I do love living here! Come visit! Thanks, Aimee. I’ve long been intrigued by Japanese culture, though gender inequality would drive me crazy. Your love for the country comes through in your posts. I hope someday to visit–it’s on my to-do list.